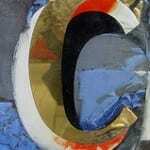 Editor’s note: This post was originally published on February 15, 2009. It was substantially revised and re-posted on November 18, 2013. Is she a granny chic choice poised for revival, or one best left in the past? Thanks to Lola for suggesting today’s Name of the Day: Edith. Edith has never fallen out of the US Top 1000. They say it takes a century for a name to sound fresh again, so Edith could be overdue – she peaked at #26 in 1894. Edith remained quite popular through the 1930s. Maybe that’s the problem – many of us know an aged Edith. And, of course, All in the Family’s Edith Bunker conjures up the image of a housecoat-clad hausfrau. Tenth century Saint Edith of Polesworth was born royal, but ended her life as a Benedictine nun. Saint Edith of Wilton was the illegitimate daughter of England’s King Edgar. After her brother was murdered, English nobles offered her the crown – but she wasn’t interested. The eleventh century King Edmund Ironside married an Edith. So did King Edward the Confessor – but his queen was powerful in her own right. When Edward died childless, her brother Harold took the crown. The Norman King Henry I chose an Edith descended from the earlier Anglo-Saxon royals for his bride, in order to cement ties to the throne. For reasons which are unclear, this Edith was crowned Matilda. Edith Wharton grew up among the most privileged families in nineteenth century America. She chronicled their lives, becoming the first woman to win a Pulitzer Prize for literature. That’s her photo above. Edith Roosevelt was First Lady of the United States from 1901 to 1909. Jewish intellectual Edith Stein converted to Catholicism late in life. Saint Edith died at Auschwitz. British nurse Edith Cavell cared for soldiers from all nations during World War I, but was executed after helping Allied forces escape from Belgium. French singer Édith Piaf lends the name romance. “La vie en rose” cemented Piaf as France’s greatest singer. Costume designer Edith Head won eight Academy Awards – more than any other woman. Dame Edith Sitwell was an eccentric, indie darling of a poet. Edie Sedgwick was part of Andy Warhol’s artistic troupe. She begins as an Old English clunker. But she slowly transforms to, as Lola puts it, a bohemian choice. Nickname Edie makes this one as wearable for a child as an adult. And yet, she’s been eclipsed by Eden. Edith hit an all-time low of #843 in 2009. Since then she’s recovered, charting at #762 in 2012. Still, that’s a far cry from the Top 100 place she occupied from the 1880s into the 1930s. This could throw open a window to use Edith, confident that she’ll blend in with Hazel and Josephine, Clara and Stella. One of the little girls in the Despicable Me movies is Edith, a sister for Agnes and Margo. If you’re looking for something a little bit quirky but still undeniably enduring, the regal, heroic and artistic Edith is one to consider. I’m several years late to this conversation, but I’m obsessed with the name Edith! Ivy was our top choice, but I kept feeling it was lacking. I started thinking about Edith, with the nickname Edie, and quickly fell in love. I think many people hear it and think it’s an old lady name, but when you give it a little more thought, Edie is a great name for a child, and Edith is a lovely formal name for use when she gets older. My taste does lean toward the old lady chic trend, but I think Edith lends a touch of the unexpected, and I love it. I happen to love Edie and like both Edith and Eden. I have an Eden because of my love of Edie -which she is often called but happens to rhyme with our surname. Is it bad that I loved it so much that I am ok that she has a rhymy name? – I find it more endearing than annoying but I seriouily had hesitations before naming her. 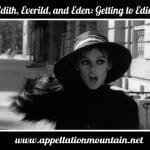 My husband wouldn’t go for Edith and Eden was one of the very few names we both liked – as it turned out my mom didn’t like any of the others and looking back I shouldn’t have let that bother me as much as it did at the time… and yet, she is all Edie! A few days out of the hospital I said out loud that I thought I messed up and that she was Maeve and that I was really considering a change. Looking at her (now and from that time- I have often thought of her as Maeve but it has never fit the way spunky, intelligent, fun Edie has and, even when being the name nerd that I am I can see her as Rose or Liv or Willow or Scarlett or Eleanor – some of our other ideas – I never can see her as a Maeve). I don’t think Eden is any less intelligent than Edith even though she is undoubtedly more modern. I see all good in Edith (and of course Eden) so if you are considering it I say go for it. Edith/Edie?? Totally a winner! and how could I forget she was nearly Evelyn?!? Lovely.. but still, not my Edie! I like Edith. Edie makes me think of Edie Brickell and Edie Falco. My first association is Downton Abbey. I did think of it as granny-chic until this post, but with the nickname Edie it suddenly sounds cool to me. I love the idea of Edie as a nickname on a spunky little girl! I do think Edie saves the name. Edith still feels rather heavy to me, at least for a small child. A family I know has three young children named Edith, Walter and Helen. Is that the best sibset ever, or what? Edith is one of my favorites right now! Unfortunately SO hates most old lady names. We’re agreed on Clara for a future daughter, maybe he’ll come around to Edith that really would be an amazing sibset. I think by seeing Edith on a little girl in Despicable Me and on a young Lady in Downton Abbey, she is growing on me. Until these pop culture references I did consider her to be an old lace table cloth found in a dusty attic trunk.. but now she is more of a vintage fashion statement. Another name that is in the spotlight due to Downton Abbey’s popularity. Lady Edith Crawly is the middle, sometimes awkward and sometimes horrible sister to Lady Mary and Lady Sybil on the show. I think Mary and Sybil will likely become more popular than Edith. I met my new cousin-in-law yesterday, and amongst other things, she revealed to me that she has a cat named Edith. And one named Mildred. And another named Lettice, at which point my Nana interjected, saying they were all awful names. I beg to differ, any lad(y) who has the guts to name her cat Edith etc. is a friend of mine. Apparently, it’s family tradition in Helena’s family to give cats old lady names. Sarah, if my other half said that, I’d shoot back with :”You can keep the cake, I’m taking Edith”! 😀 Mine ruins things like Otto “I like to get blotto”, Grace “that’s amazing, Grace” and Asher “crasher, smasher, flasher” Sigh. So, at least yours has a comeback! I’ve always loved Edith:) But the dh has a long running saying he says, “you can’t have your cake and Edith, too”. So it’s out for us. Sigh. Nice name though! I pop her in the same boat as my old love Clara and newer love of Ada. I just don’t think I’d use her myself for some reason? PS- Lola: I adore Edith Viola Petronel! She’s very charming, in a creative kinda way! Edith—hm. Now that I think about it, I really like it. I really do. It’s funky and edgy, but in a quiet way. It also has that feminine yet strong feel that I love so much in names, with some cool namesakes as an added bonus (I’ll have to read up more on Saint Edith of Wilton, she sounds like a character). Lola, I think you should use this, it’s so perfect for you and sounds lovely with Josephine. Don’t know if I’d use it myself, though; I’ll add it to my long list and see if my infatuation with it sticks. EE-dith. eh-DEET. The second pronunciation I hear quite a bit more often, since most of the Ediths I know are Hispanics under 30. Not a name I would choose, but I think the nn Edie blends right in with a lot of names that are rising in popularity. Quite a varied list of famous bearers. I’m loving Edith- I love the nn Edie, it’s chic, old-timey sound, and the fact that it’s not too common. Also, there are so many cool Ediths, like Wharton and Sitwell, which are mentioned. I’m not brave enough to use it as a first, but as a middle definitely. Yep, Edith is definitely usable and to me, completely appealling! Huzzah for Edith! I love Edith and Maud (this spelling especially) too. I’m such a fan of consonant-y girls’ names. Given the revival of names that seem similar to Edith (e.g., Hazel as mentioned), I’m surprised she’s stuck so far down in the Top 1000, but I’m sure her day is coming around again. I can’t say it’s “ruined,” but I’m right there with photoquilty about the Bunkers – I can’t help but hear that high, nasal voice…. but, if pushed, I also agree with Kate – Edith trumps Eden… I’m just not sure I really like Edith all that much. Edie definitely helps a lot, but I don’t know that it makes up for my lack of enthusiasm for the full name. I adore Edith. I think Edie would make her completely useable to most people; it’s practically Addie. Eden, on the other hand, makes me gag a bit.